Midweek match-ups were aplenty in Week 19 of Major League Soccer with no fewer than six games taking place. Ricardo Salazar was a busy man during Wednesday night’s clash between Seattle Sounders and FC Dallas, brandishing two red cards, and he was busy last week too. 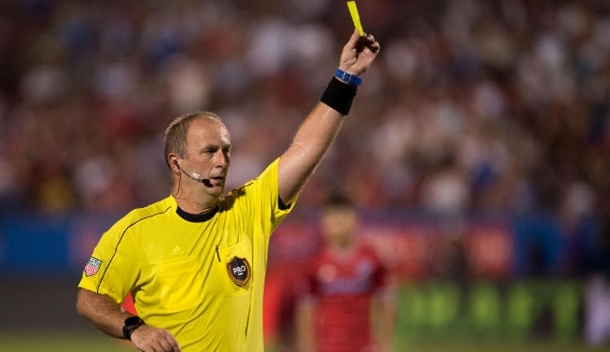 During Real Salt Lake’s draw with Montreal Impact in Week 18, Salazar and AR Chris Strickland demonstrated some outstanding officiating and that was picked up by PRO’s Paul Rejer in the latest Play of the Week. The weekend action begins in Los Angeles, where Galaxy take on Houston Dynamo on Friday night. Mark Geiger, a two-time MLS Referee of the Year who also picked up the CONCACAF honor in 2014, takes charge at StubHub Center. After receiving praise in Play of the Week 18, AR Strickland will run the line in Dallas’ second game in four days. Baldomero Toledo referees, and he was in charge of the 2010 MLS Cup when the current Western Conference leaders lost in extra-time to Colorado Rapids. Rapids are currently the nearest competitors to Dallas in the standings and are at home to U.S. Open Cup holders Sporting Kansas City, with Drew Fischer the referee in the 9pm ET kick-off. Silviu Petrescu, Hilario Grajeda and Ismail Elfath have also been assigned to Saturday. There’s a first assignment of the campaign for Alejandro Mariscal, whose one and only MLS center appearance came in 2010. Mariscal has appeared as a fourth official in the league just short of 100 times since 2009 but he takes charge of San Jose Earthquakes versus Toronto FC this weekend. San Jose’s Avaya Stadium home will host the MLS All-Star game at the end of this month, and the two selected Ars for the showpiece event are involved this Sunday as Week 19 draws to a close. Frank Anderson is in Portland where MLS Cup champions Timbers face rivals Seattle Sounders, and Matthew Nelson runs the line in Canada at Saputo Stadium, where Montreal Impact welcome Eastern Conference pacesetters New York City. Jair Marrufo and Armando Villarreal are the respective center referees for those games, before Alan Kelly brings the action-packed week to a close. The current MLS Referee of the Year is at Talen Energy Stadium, supported by Brian Dunn, Eric Weisbrod and Robert Sibiga, for Philadelphia Union against New York Red Bulls.